April Boyle, the Director of Recruitment for D:hive, makes a presentation at a recent business start-up meeting sponsored by the city’s Community & Economic Development Department. For anyone interested in starting a small business, look no further than down the street. Seriously — Jos. Campau has plenty of vacant storefronts, and as the Hamtramck Business Start-up Information Session showed, all you need is an idea. That was the takeaway from last Wednesday’s meeting at Cafe 1923. About 60 people were on hand to hear from a half-dozen representatives from various agencies that help get new businesses off the ground. 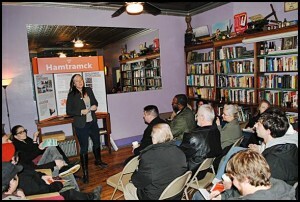 Organized by the Community & Economic Development Department, the gathering was intended to both help potential business owners connect with the appropriate resources and also highlight Hamtramck as a viable operating location. The first representative to speak was Kory Scheiber of the Detroit Micro-Enterprise Fund (DM-EF). Essentially a fiduciary between large banks that don’t like to lend and small businesses that need the money, the DM-EF has the capability of providing businesses — both new and existing — with a serious infusion of cash. According to Scheiber, new businesses are eligible for up to $10,000 in funding, with existing businesses eligible for up to $35,000. Most of the money is given directly to suppliers, and the loan has an interest rate of prime-plus-two with a maximum of 7 percent. Next up was April Boyle, the Director of Recruitment for D:hive. Among the many things that D:hive does — in addition to welcoming people to Detroit and helping them engage in the community — is host a workshop called BUILD which focuses on opening and operating small businesses. Based on a nationally recognized curriculum that was constructed especially for Detroit, BUILD supports entrepreneurs by helping them turn their ideas for a program or business into action. Essentially an “Intro to Entrepreneurship” course, Boyle said it offers help with credit checks, business law, accounts, marketing and other services. After beginning in January of 2012 at the D:hive location in Detroit, classes are now being offered at Courage Coffee in Hamtramck. The next eight-week course begins on March 14 and will be held every Thursday between 6 and 9 p.m. The cost is between $100 and $300 depending on income. “It’s a safe place to explore an idea, take that idea and turn it to a project, and then make that project a business,” said Boyle. Third up was Dan Blue from Kiva Detroit. Kiva is an international peer-to-peer lending program that helps provide people with interest-free loans of up to $5,000 by connecting them with micro-funders from throughout the world who believe in their project. Blue explained that with a Kiva loan, lenders are motivated to fund projects because they are compensated in some way by the project upon its completion – kind of like a “this-for-that” arrangement. The fourth speaker of the night was Sean Gray, a business consultant for the Michigan Small Business & Technology Development Center (MI SBTDC). The MI SBTDC offers training, research, consultation, and courses for potential business owners and can teach them the skills necessary to run a small business. Though the MI SBTDC doesn’t offer any money, it also doesn’t charge anything – other than “effort,” according to Gray. Most importantly, it will help you realize exactly what is needed to be successful. “I’m a realist. I will help you unpack the baggage of your business and finances, and put you on the right track,” says Gray. Sonia Harb of the Arab Community Center for Economic & Social Services (ACCESS) spoke fifth. ACCESS will be launching a new training session in Dearborn beginning in April, and is looking to link immigrants to jobs and services. “We help anyone with a cultural or language barrier that makes it challenging to deal with a traditional provider,” said Harb. The final speaker of the night was Angenette VanLieu-Muno, an AmeriCorps VISTA volunteer working at Friendship House. VanLieu-Muno is currently managing a program that helps people with handicraft skills and sewing ability earn money for their work by selling it through outlets like Ferndale’s Rust Belt Market and online. A final representative from HATCH Detroit was scheduled to attend but was unable to make it. HATCH Detroit is a vehicle to champion and support independent retail businesses and is essentially a contest to determine the business desired most by the community. Businesses compete against each other for a $50,000 grant and the winner is decided by the public. At the meeting’s conclusion, Friedmann spoke about the opportunities available to businesses opening in Hamtramck. Among the ways the city can help new businesses is the New Business Start-up Grant, which can help subsidize rent, rehab a building, or cover payroll. The city also offers the Facade Improvement Grant and Brownfield Development grants.